A smart phone with the Netflix app is seen on the screen in Hong Kong, Hong Kong, on July 30, 2018. 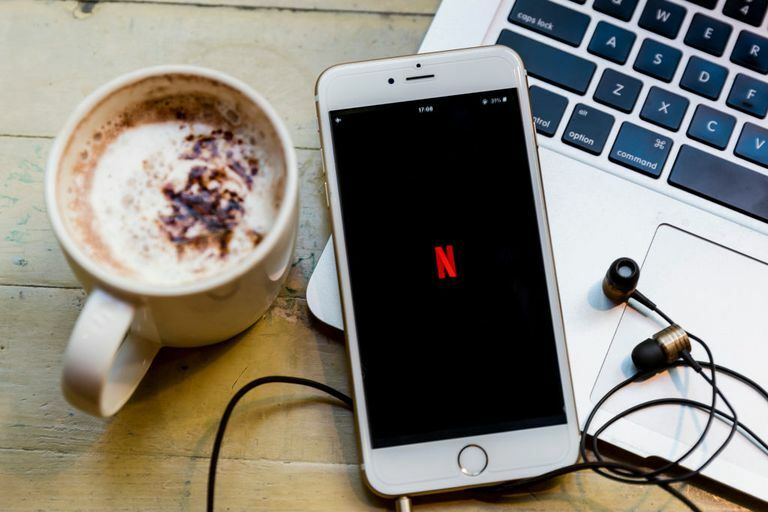 Binge watching Netflix can be a great way to kill some time, but users need not have their experience hindered by subtitles if they are not needed. Turning Netflix subtitles off and on is a very simple process, once users access the subtitles settings on a show or film. Read on to learn how to navigate Netflix's subtitles settings on computers, smartphones, tablets, and other devices to turn closed captioning off and on. Hover the mouse cursor over the Netflix screen to bring up the information bar for the video. To the right of the media's information are video settings, including Subtitles. Hover the mouse cursor over the Dialogue icon to view the subtitle settings, then select Off. This will automatically turn off the subtitles. To turn off Netflix subtitles with a browser extension users can use the Unsubtitle for Netflix extension. This extension is specific to Google Chrome. Select Add to Chrome, and you'll be prompted to confirm the action. Select Add extension. Tap the screen to bring up the progress bar for the video. Tap Audio & Subtitles below the progress bar. Tap Subtitles > Off > OK. Tap the Dialogue icon in the top right corner of the screen to access the Subtitle settings. Tap Off, then X to return to the media, now without subtitles. To turn off Netflix subtitles on a Chromecast dongle, users must navigate to settings from the Android or iOS device they're casting from. Refer to the instructions for turning off Netflix subtitles on an Android or iOS device listed above to complete this function. For Apple TV 2 and Apple TV 3 models, users must hold down the center button on the Apple TV remote to access the subtitle settings. Note: For Apple TV 4 or Apple TV 4K models, users must swipe down on the Apple TV remote's touchpad to access the subtitle settings. Select Subtitles > Off > Menu to turn subtitles off and close the settings. To turn off Netflix subtitles on a Roku device, users must use the Roku remote to navigate through the Netflix app's settings. Select a Netflix show or film. Use the Roku remote to navigate down and select Audio & Subtitles. The settings show subtitle options to the right. Select Off, then OK to confirm the option. Press Back on the Roku remote to return to the information screen. Press Resume playing or Play from the beginning to view the media. If users wish to turn off subtitles after starting a video, they must press Back on the Roku remote to return to the information screen and follow the instructions above. Newer Roku models allow users to access the subtitle settings while a show or movie is playing by pressing the Down arrow on the Roku remote and selecting Audio & Subtitles. Navigate to and select the Dialogue icon. Select Off to set the option. There are different brands and types of Blu-ray players, Smart TVs, and Set-top boxes, so instructions may vary slightly. Press OK, Done or X on the remote to confirm the option. Press Play to view the media. Press A to bring up the subtitles setting. Press the Menu button on their Fire TV remote or Fire TV remote app on a smartphone. Press the Menu to set the option. If users decide they would like to view subtitles on Netflix again, they can access the subtitles settings for their device using the instructions provided above. Below Off are the languages Netflix has available for subtitles for any particular show or film. These languages include English, French, Spanish, Simplified Chinese and Traditional Chinese. Select a language and confirm the option to set the subtitles.